For many people, car-sharing networks such as ZipCar, RelayRides and Car2go are great alternatives to owning and maintaining their own vehicle. Such networks are a convenient and relatively affordable way to access transportation without having to worry about monthly car payments, insurance, gas prices and parking. Added bonus: When multiple people in one area share a single vehicle, pollution is reduced. Some cities, like Washington, D.C., actively promote car-sharing as a supplement to public transportation. You rent the car by the hour and pay for the length of time you actually use the vehicle. Some networks like Car2go even let users rent vehicles by the minute. Unlike conventional rental companies where you have to pay for a full day’s rental regardless of how long you actually use the vehicle, car-sharing programs have a more budget friendly pay-as you-use model. Customers usually have a choice of vehicles, and typically the hourly rate includes the cost of fuel and damage and liability protection. That means if you get into an accident with a shared vehicle, you are fully protected against insurance claims in most circumstances. Car sharing also offers an opportunity for some people to make a little extra money with relatively little effort. 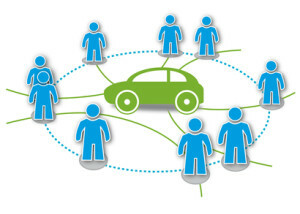 If you have an infrequently used car, you can put it to work making some money for you through a car-sharing network. Renting your car to someone in a peer-to-peer car-sharing network is almost as easy as renting one for use yourself. Services like RelayRides, GetAround and FlightCar act as brokers in helping people looking for a car meet up with those looking to rent one out. The details might vary by network, but in most cases it only takes a completed online form to list your car, upload a few pictures of your vehicle and show proof of insurance. The car-sharing company then does the job of hooking you up with people in your area who are looking to rent a vehicle for a short period of time. Some car-share networks like RelayRides will even vet drivers and make sure they have a safe driving record before passing them on to you. Car owners typically have the ultimate say when renting their vehicles out to others. Before signing your car up with a peer-to-peer car-sharing network though, make sure you study the potential insurance implications of the move. Auto insurance companies like The Hartford are still in the process of figuring out how to deal with the phenomenon. In the meantime, experts suggest that you check your auto insurance policy to understand the full implications of signing up with a car-sharing network. Standard auto insurance polices do not cover situations where you rent out your insured vehicle to a third party for profit. Some car-sharing companies bundle in the cost of insurance coverage in their commissions.